Easy Slow Cooker Pot Roast - Eat. Drink. Love. After last week’s sugar high, I am ready for some good dinners this week. Fall means time to pull out the crock pot and put it to some good use! Sundays are my cooking days and I always like to try to make a nice dinner for Sunday nights. It was a pot roast kind of night. This pot roast is SO easy to make and while it makes a lovely Sunday dinner, it is also great for any night of the week because you just have to throw it all together in the slow cooker and let it go! And while I only made this for the hubs and I, it would be perfect for a dinner party! The gravy for this pot roast comes out so flavorful and delicious and the meat is perfectly fork tender! 1. In a pan, heat olive oil. Try to trim away any large pieces of fat on the roast. Sprinkle salt and pepper to both sides of roast. Sear meat on both sides until brown. 2 In slow cooker, mix together the soup, onion soup mix, wine, and water. Add roast and cook on low setting for 7-8 hours or on high setting for 4-5 hours. If adding carrots or potatoes, I recommend adding these during the last 1 1/2-2 hours of cooking. I love pot roast! I love how simple yours is, but it looks so tender and flavorful! I serve mine the same way, with mashed potatoes, smothered in gravy! I often forget about my crockpot, but this recipe makes me tempted to get it out and use it soon! It’s such a great gadget to have! Sounds like a perfect pot roast, I’ve been craving it lately! I think it’s that time of year for it! What a lovely plate for dinner,pot roast looks tender and Yummy. Thanks, Ridwan! It was really tender! Just got a new crockpot, so this wonderful recipe is right on time. Beef and mushrooms are a favorite combo around here. Yum! Time to put it to use, Tina! I love beef and mushrooms together too! Thanks, Kelly! I love using it too. I need more crockpot recipes in my repertoire! Oh, I be the sherry gave it a great flavor! Let me know when you decide to try this! How great are slow cookers? Your recipe looks delicious! I love pot roast!! I can’t wait until I get further along in cleaning out my freezer and I need to actually buy some meat again! Roast is the first thing I am going to buy! Thanks, Erin! It’s definitely the time of year for roasts! Thanks for this post! It sounds silly, but I’m in the market for an easy recipe like this! Loveee! Not silly at all, Liz! This recipe is super simple! 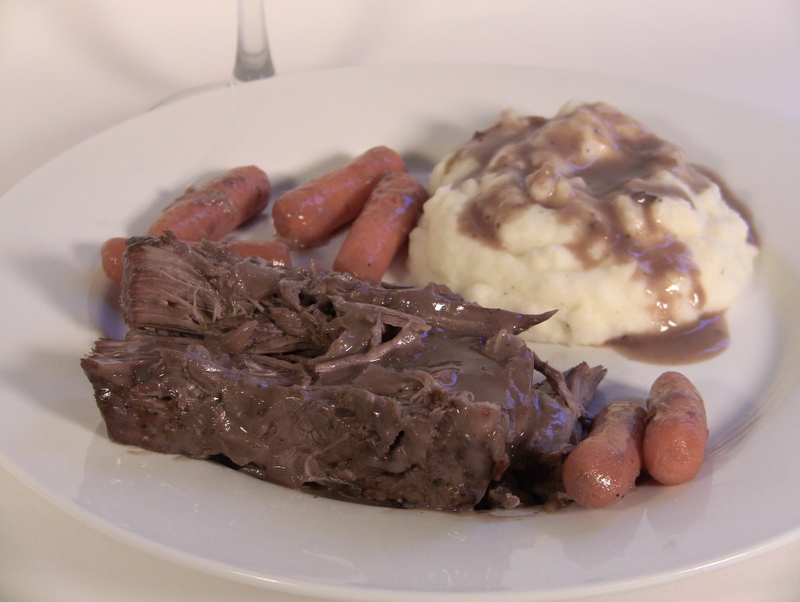 Pot roast is delicious and I love the practicality of the slow cooker – what a great recipe! I’m going to try this one – I need a few sit and stew, enjoy when you get home meals that the whole family will enjoy. Thanks! Thanks, Kelly! I hope you and your family like it! That’s so funny that you say that because right after I got it going, I realized that I had 3 cans of beef broth in my pantry that I accidentally bought (I meant to buy chicken broth!). I immediately thought I should have used the broth instead of the water! Doh! This looks delicious! I always cook my pot roast in the oven, but I love the convenience of a slow cooker…nice to have more than one recipe, too! Thanks! Thanks, Ann! I’ve made it in the oven once before and it still came out really good! I love the slow cooker because it fills the house with such a wonderful smell all day! I love pot roast with the cream of mushroom soup and onion soup mix – it is my all time favorite and I haven’t had it in a long time. You added red wine here which is a huge flavor booster to an already tasty recipe – i am definitely trying this next time! Thanks, Becki! This was actually the first time that I added red wine and I was really happy with the results! I think next time I am also going to add beef broth instead of water for even more flavor! I love crock pot meals…they are so simple and always make the house smell fantastic :) This one looks awesome! I love the way it makes the house smell too! We make something very similar to this once or twice a month during the winter. It’s the best! So cozy and comforting. And I love how easy it is to make. Plus the house smells awesome while it’s cooking. Yummy! Thanks, Tori! It is a great dish to have in the colder months!! I love how it fills the house with such wonderful smells too! It is very comforting! I know I’m missing a lot, but I have never used can of cream of mushroom soup before… yeah am I a real foodie?? Hehee. This pot roast looks so delicious. Definitely it’s time to try cream of mushroom soup! Stephanie….don’t you just love crock pot cooking in the fall and winter. There is nothing like coming home at the end of a busy day to have your home scented with the aromas of a warm and comforting dinner. This pot roast is just beautiful! I will definitely be trying this in the near future. And you are a girl after my own heart. While some prefer to cook potatoes in with the roast….I prefer to serve mine with a side of mashed potatoes! This is just a plate of heaven! I am so planning on making this tomorrow! Awesome! I think you are my #1 recipe-trier!! Let me know how you like it!! Absolutely! I love food. Getting to make tasty food, and better yet food that’s not so bad for you, that’s even better!